Immediately I finished reading Emmanuel Iduma’s novel “Farad, I felt the need to tell others about it. Not as a professional reviewer, which I am not, but as a reader pleased with a book bought with hard-earned Naira. I write with a thought gnawing at the back of my mind that Farad should be left for the reader to discover; as such, I will try not to give too much away. You know how you at times stand on a balcony, watching strangers go by; wondering where they are from, where they are going and what lives they lead? Or how you enter a church, a classroom, an office, and wonder about the people there; what they are thinking, what’s responsible for those sad eyes, secretive smiles and angry faces? Well that is Farad, a painting of random people linked by a current–in this instance a university campus church. You know how u start a novel with preconceived notions of what you’d see inside. You might not necessarily know the story beforehand, but you take for granted that the story’s structure would be usual, with a beginning, middle and an end—not necessarily in that order. Farad is not one of those novels. Yes, it does have a beginning, and an end, however there is nothing like your conventional middle and even the end is not defined by the journey there. 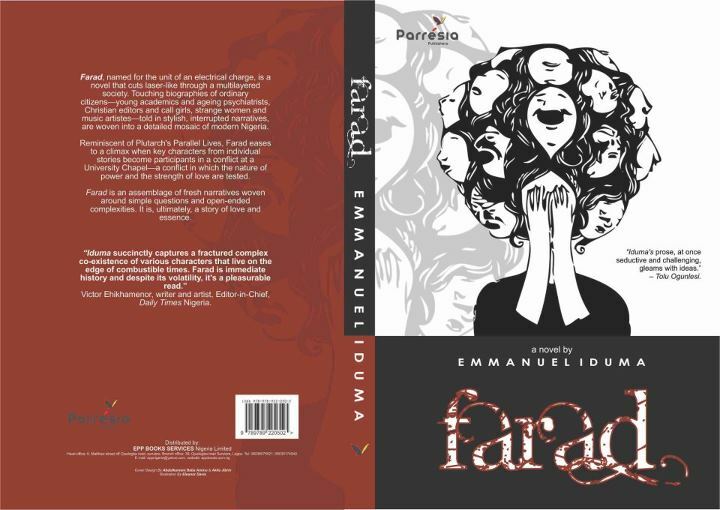 Farad is Emmanuel Iduma’s first novel and it shows the signs of great things to come. I am sure the book will generate a buzz. It is autobiographical enough to give the discerning an insight about the author (a certain friend of his that we know got honourable mention), and fictionalised enough to create the sort of balance talented writers have a penchant for. I started reading as I do most other novels, without recourse to the blurb and statements from reckoned-with writers that appears on the cover and first pages. However, by the time I was done with part one, I had to take a pause to read what the aforementioned known writers had to say about the writer and his craft and found myself agreeing with every one of them. Emmanuel Iduma is a master storyteller whose natural intelligence shines through without effort. Emmanuel Iduma’s voice is his own and his style original. He did away with those unsightly italics that we gifted to our native words when writing them in English, then he went further to create his own words where conventional English words failed to convey the feeling sought. Don’t seek for a dictionary to find the meaning of eneminize and eneminization—we know what they mean. Also, he wrote in American English, the language of a greater number of the literature books we read here. Farad suffers, not from the author’s lack of skill, but from its editor’s inability to detect small-small sequencing issues. Clear examples of these are on page 13 and 37. You’ll shake off these little misses, that’s if you see them, and should drink off the well of Iduma’s wide reading as names of books, authors and quotes finds resting places across the length of Farad. I found Farad pleasurable reading and happily recommend it for anyone willing to sink his/her teeth into the work of a talent that the world should be on the lookout for. Before I forget, Mazi Iduma, it’s Igbo, not Ibo. It’s a new age, let’s also stop using oyibo misspellings of our indigenous names.